GENE DISRUPTION PHENOTYPE: Lethal when both U3a and U3b are disrupted. Click here and see that yeast and humans have corresponding snoRNAs. Click here and see that yeast and Arabidopsis have corresponding snoRNAs. 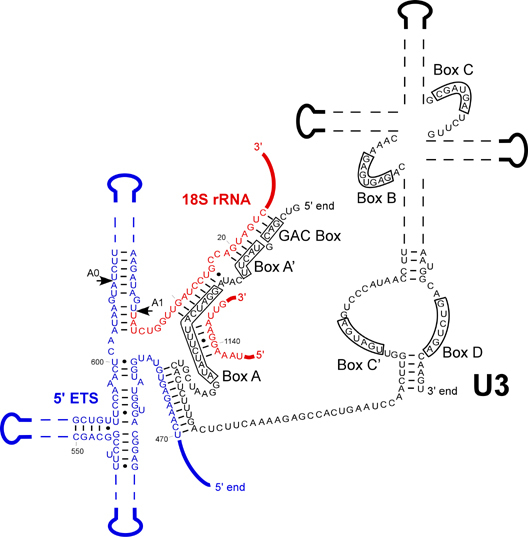 Click here for broad coverage of the corresponding U3 snoRNAs. Click here to examine conservation of the snoRNA in fungal genomes using BLAST for U3a sequence. Click here to examine conservation of the snoRNA in fungal genomes using BLAST for U3b sequence. Click here to view the SGD entry for U3a snoRNA. Click here to view the SGD entry for U3b snoRNA. Hughes, J. M., D. A. Konings, and G. Cesareni. 1987. The yeast homologue of U3 snRNA. EMBO J. 6:2145-2155. Hughes, J. M., and M. Ares, Jr. 1991. Depletion of U3 small nucleolar RNA inhibits cleavage in the 5' external transcribed spacer of yeast pre-ribosomal RNA and impairs formation of 18S ribosomal RNA. EMBO J. 10:4231-4239. Dandekar, T., and D. Tollervey. 1993. Identification and functional analysis of a novel yeast small nucleolar RNA. Nucleic Acids Res. 21:5386-5390. Jansen, R., D. Tollervey, and E. C. Hurt. 1993. A U3 snoRNP protein with homology to splicing factor PRP4 and G beta domains is required for ribosomal RNA processing. EMBO J. 12:2549-2558. Schimmang, T., D. Tollervey, H. Kern, R. Frank, and E. C. Hurt. 1989. A yeast nucleolar protein related to mammalian fibrillarin is associated with small nucleolar RNA and is essential for viability. EMBO J. 8:4015-4024. Samarsky, D. A., G. Ferbeyre, E. Bertrand, R. H. Singer, R. Cedergren, and M. J. Fournier. 1999. A small nucleolar RNA:ribozyme hybrid cleaves a nucleolar RNA target in vivo with near-perfect efficiency. Proc. Natl. Acad. Sci. U. S. A. 96:6609-6614. Samarsky, D. A., and M. J. Fournier. 1998. Functional mapping of the U3 small nucleolar RNA from the yeast Saccharomyces cerevisiae. Mol. Cell. Biol. 18:3431-3444. Dunbar, D. A., S. Wormsley, T. M. Agentis, and S. J. Baserga. 1997. Mpp10p, a U3 small nucleolar ribonucleoprotein component required for pre-18S rRNA processing in yeast. Mol. Cell. Biol. 17:5803-5812. Wu, P., J. S. Brockenbrough, A. C. Metcalfe, S. Chen, and J. P. Aris. 1998. Nop5p is a small nucleolar ribonucleoprotein component required for pre-18 S rRNA processing in yeast. J. Biol. Chem. 273:16453-16463. Wormsley, S., D. A. Samarsky, M. J. Fournier, and S. J. Baserga. 2001. An unexpected, conserved element of the U3 snoRNA is required for Mpp10p association. RNA 7:904-919. Dragon, F., J. E. Gallagher, P. A. Compagnone-Post, B. M. Mitchell, K. A. Porwancher, K. A. Wehner, S. Wormsley, R. E. Settlage, J. Shabanowitz, Y. Osheim, A. L. Beyer, D. F. Hunt, and S. J. Baserga. 2002. A large nucleolar U3 ribonucleoprotein required for 18S ribosomal RNA biogenesis. Nature 417:967-970. Kufel, J., C. Allmang, L. Verdone, J. Beggs, and D. Tollervey. 2003. A complex pathway for 3' processing of the yeast U3 snoRNA. Nucleic Acids Res. 31:6788-6797. Chen, W., J. Bucaria, D. A. Band, A. Sutton, and R. Sternglanz. 2003. Enp1, a yeast protein associated with U3 and U14 snoRNAs, is required for pre-rRNA processing and 40S subunit synthesis. Nucleic Acids Res. 31:690-699. Vos, H. R., R. Bax, A. W. Faber, J. C. Vos, and H. A. Raue. 2004. U3 snoRNP and Rrp5p associate independently with Saccharomyces cerevisiae 35S pre-rRNA, but Rrp5p is essential for association of Rok1p. Nucleic Acids Res. 32:5827-5833. Dobbyn, H. C., and R. T. O'Keefe. 2004. Analysis of Snu13p mutations reveals differential interactions with the U4 snRNA and U3 snoRNA. RNA 10:308-320. Hoang, T., W. T. Peng, E. Vanrobays, N. Krogan, S. Hiley, A. L. Beyer, Y. N. Osheim, J. Greenblatt, T. R. Hughes, and D. L. Lafontaine. 2005. Esf2p, a U3-associated factor required for small-subunit processome assembly and compaction. Mol. Cell. Biol. 25:5523-5534. Marz, M., and P. F. Stadler. 2009. Comparative analysis of eukaryotic U3 snoRNA. RNA Biol 6:503-507. Last update: January 28, 2010 4:44 PM.